Building work, vikings, pottery etc. so much can get in the way even of a mild obsession. The 'gallies' centre of my brain was reactivated, however, by seeing a picture which I just had to get. It is a product of the Deutschen Zentralinstitut for Lehmittel of the DDR. There are many of these floating around in auction houses and antique shops in Germany and Denmark but I had not seen this one. 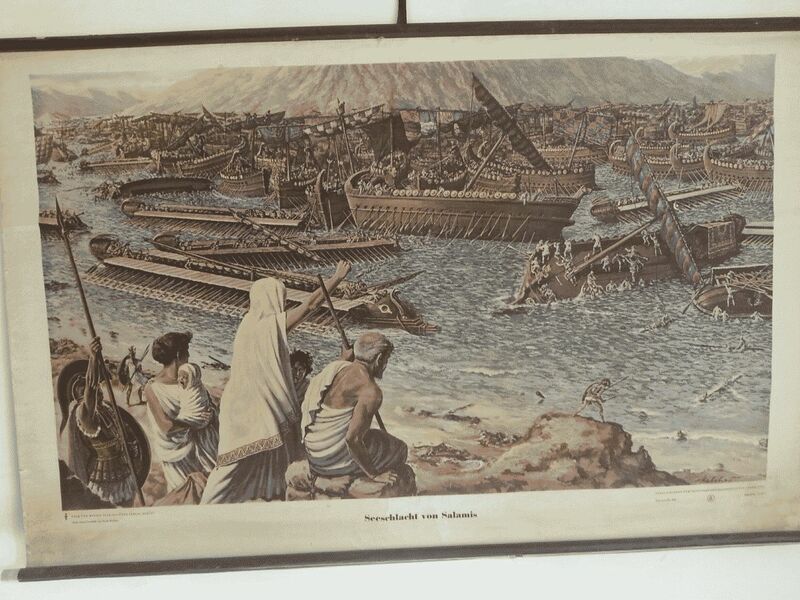 The title is 'Seeschlact von Salamis' - the 'Sea Battle of Salamis' - caught my eye immediately! I have seen many dealing with natural history or technical subjects. Historical ones more often include medieval or stone age people. But this was a find. These posters were made for use in teaching before the days of PC projectors and when even slide projectors or OHPs were in short supply. This one is 120cm wide and in colour. The artist was Eric Melcher - no trace on a net search - he was probably a working illustrator rather than a kunstmaler. The detail is worthy of Peter Connolly. It is difficult to date the poster. Some others I have are from the 80s. This could be older but I have yet to find a catalogue of the DZL production. 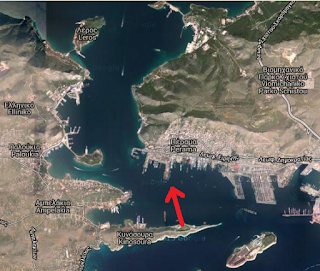 In any event, this is something produced before Olympias project was conceived, before Osprey, before digital graphics. It is, however, based on sound information. TOPOGRAPHY : The viewer is with a crowd of Athenians on the coast of Salamis - probably on the north side of the end of Cynosaura. One is looking north-west towards Mount Ægalios and St. Georgios Island is visible top left. Full marks to Herr Melcher. 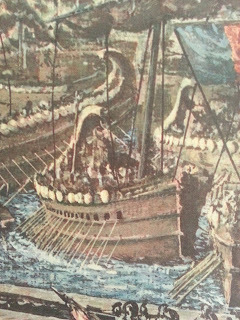 BATTLE SITUATION : Interpreting ancient accounts of the battle is as tricky as negotiating the straits with a large fleet.... The poster does show a plausible situation, however, and one favoured by some commentators. 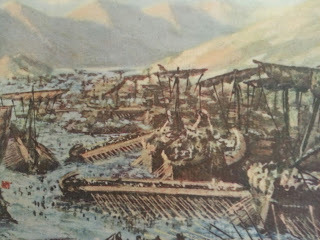 The Greek ships are skirting the Pesians on the south side and hemming them up against the mainland. The Persians are crowded in on each other and the Greeks are ramming those easy targets they find at the edge of the mass. 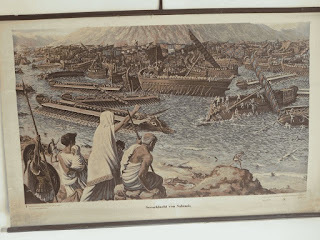 GREEK SHIPS : The Greek ships are based on the Lenormont relief . They are shown with missile screens as per the ancient sources but do not have high bridges running fore-aft - actually accurate! They are given stern canopies a la the Pompeiian friezes. This is a laudable attempt - the Lenormont relief has no stern. Trieres bow - officer is realistically prone. Apobathra ....possible..? 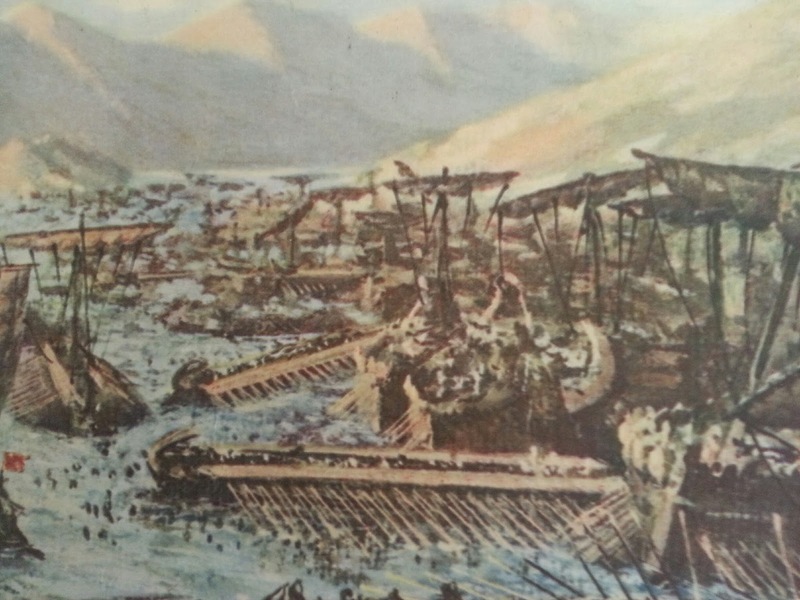 PERSIAN SHIPS : The Persian ships are based on a mix of Phoenician coins, the Sidonian ships and hippoi from Sargon's palace frieze and Herodoto's comment that they were higher than the Greeks. 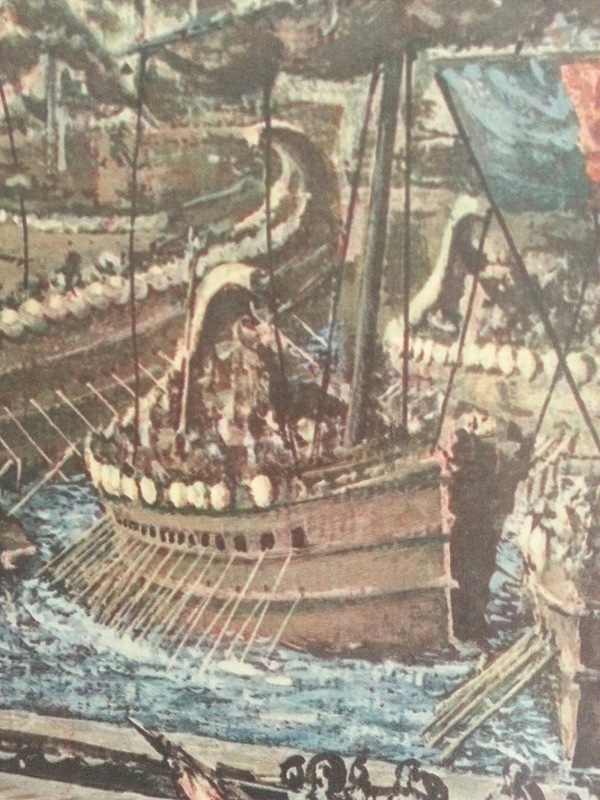 The ships are towering over the trieres and have two rows of ports for oars. 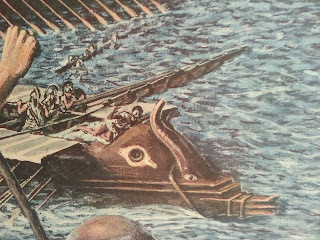 They bear a moon symbol standard and pygmy god figures which identify them closely as Phoenician - as was a large part of the Persian fleet. 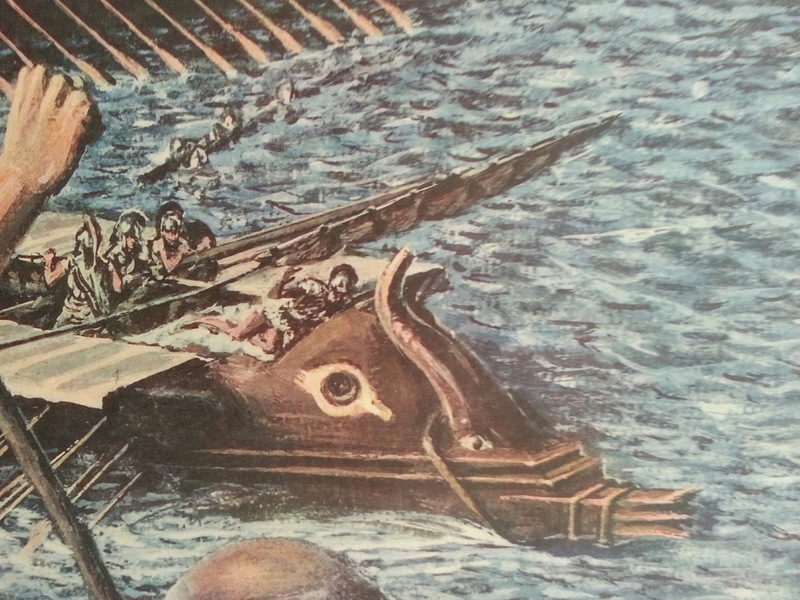 They are too massive for what we now know about triremes. But ideas from the seventies would have difficulty in faulting these. FIGHTING MEN : The Greeks are mostly hoplite types - rushing to reple boarders, though in one case taking a ladder along to board a behemoth ? The Persians are bowmen and spearmen, many rather scythian -looking. 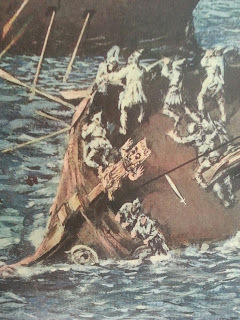 Doomed Phoenicians on their idol-bearing ship. ONLOOKERS : The artist has made a touching scene of worried onlookers including fearful children. A brave hoplite stands ready while another is off to deal the coup de grace to some Persian survivors. 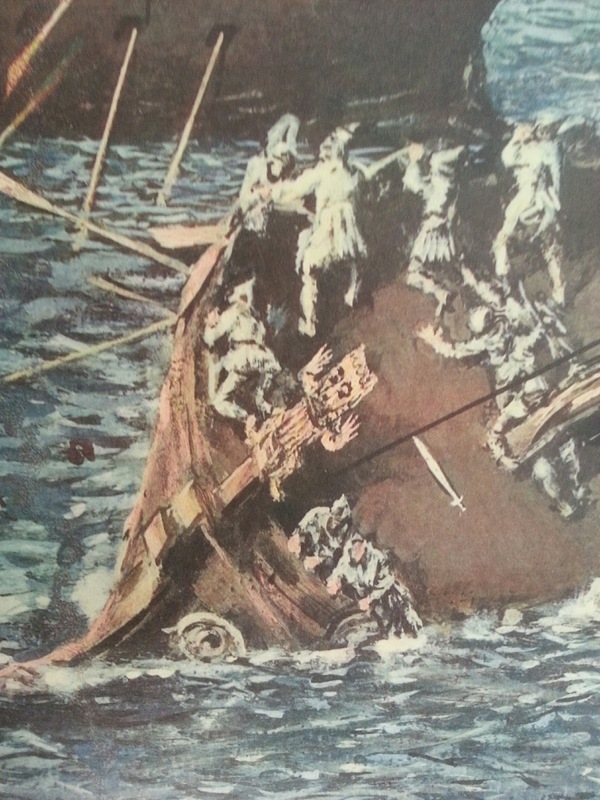 The whole scene is full of action and executed in a style which or workmanlike and detailed without being a laborious exercise in rivet-counting as are many Osprey illustrations. Criticisms using perfect hindsight could include that both sides have masts and sails, that the Greeks have a natty folding-joint system to lower their masts ! and that the Persian ships are too high and too similar. But the impact and drama of the picture makes a powerful impression. If anyone else has seen this poster or knows more about it I would love to hear from them.